The Tesla Model X is a mid-size all-electric luxury crossover utility vehicle made by Tesla, Inc.. The vehicle is unique in the concept that it uses gull-wing doors instead of traditional automotive doors. The prototype was unveiled at Tesla's design studios in Hawthorne on February 9, 2012. The Model X has an official EPA rated 237–295 mi (381–475 km) range and the combined fuel economy equivalent and energy consumption for the AWD P90D was rated at 89 mpg‑e (39 kW⋅h/100 mi). The Model X was developed from the full-sized sedan platform of the Tesla Model S. The Model X has an EPA Size Class as an SUV, and shares ~30% of its content with the Model S, half of the originally planned ~60%, and weighs about 10 percent more, both are being produced at the Tesla Factory in Fremont, California. First deliveries of the Model X began in September 2015. After one full year on the market, the Model X ranked in 2016 seventh among the world's best-selling plug-in cars. Global cumulative sales since inception totaled 106,689 units through September 2018. Initially, Tesla planned for deliveries to commence in early 2014. However, in February 2013, the company announced that deliveries had been rescheduled to begin by late 2014 in order to achieve its production target of 20,000 Model S cars in 2013. In November 2013, Tesla said it expected to begin Model X high volume production the second quarter of 2015. In November 2014, Tesla again delayed and announced that Model X deliveries would begin in the third quarter of 2015. Deliveries began on September 29, 2015. Among the reasons for delay were problems with the falcon-wing doors and cooling the motors when hauling trailers. In 2016, the company filed a lawsuit against Swiss hydraulics firm Hoerbiger Holding for not producing satisfactory falcon-wing doors for the Model X. Tesla claimed the doors suffered from oil leakage and overheating. Many believe this is one of the reasons for the delay of the Model X. The lawsuit was settled in September 2016. On July 29, 2015, Tesla announced a referral program though October 31, 2015 wherein owners of a Model S who refer 10 new buyers gain the option to buy a Founder Series Model X for the price of a base model. The first person (in each of three regions; Americas, Europe, Asia-Pacific) to reach this 10 referral point would be given this model for free. On July 13, 2016, Tesla introduced its Model X 60D, which is slightly lower priced than the Model X's starting price. The Model X 60D has a 200 mi (320 km) range and can accelerate from 0 to 60 mph (0 to 97 km/h) in 6 seconds, with a top speed of 130 mph (210 km/h). The battery capacity in the Model X 60D is 75kWh but has been software restricted to 60kWh. Post purchase, owners have the option to unlock the additional 15kWh bringing the 60D to 75D range specifications. Tesla plans to use the Model X platform for the Tesla Minibus. Global sales passed the 10,000 unit mark in August 2016, with most cars delivered in the United States. In August 2016, Tesla introduced the P100D with Ludicrous Mode to be the new top Model X. The P100D has a 100 kWh battery, accelerate from 0 to 60 mph (0 to 97 km/h) in 2.9 seconds (0 to 100 km/h (0 to 62 mph) in 3.1 seconds) and 289 mi (465 km) of range. In October 2016 Tesla discontinued the 60D version and made the "Smart Air Suspension" standard instead of coil springs, increasing the base price to $85,000. In June 2017, the 90D version was discontinued. In January 2019 Tesla discontinued the 75D version, making the 100D the base version of the Model X. The base price of the Model X 100D is $97,000 as of Jan 2019. A series production vehicle was unveiled on September 29, 2015. It has a panoramic windshield. According to Tesla CEO Elon Musk, it is the safest SUV in terms of frontal and side impact crash, being more than twice as safe as the next closest SUV in rollover tests as well. The Model X does not come with Autopilot as standard, but has an optional Enhanced Tesla Autopilot. The Model X has standard a collision avoidance system that uses radar-based autonomous emergency braking (AEB) and side-directed ultrasound detection that steers the car away from threats. Tesla uses a wide-band radar system to help prevent the falcon wing doors from hitting nearby objects when opening or closing. The Model X has double-hinged falcon wing doors which open upwards, allowing the leading edge of the door to remain tucked close to the body, unlike traditional gull-wing doors. Tesla says the falcon doors make access easier. The Model X offers room for seven adults and their luggage in three rows of seating and front and rear trunks. The Model X weighs about 8% more than the Model S and shares about 30% of its parts content – down from around 60% expected when development began. Over the years, the Model X has been available with five lithium-ion battery packs, rated at either 60, 70, 75, 90, or 100 kW·h. The highest performance version of the model P100D goes from 0 to 60 mph (0 to 97 km/h) in 2.9 seconds and the 1⁄4 mile (400 meters) in 11.4 seconds, outperforming the fastest SUVs and most sports cars. The Model X's all-wheel-drive system uses two motors (one for the front and the other for the rear wheels), unlike conventional AWD systems that have a single source of power. The Tesla Model X 100D has an official EPA rated range of up to 295 mi (475 km). The company planned to offer rear-wheel-drive models, but instead all models use all-wheel drive. The standard AWD has 259 horsepower (193 kilowatts) on both the front and rear motors, while the performance edition has 259 hp (193 kW) front and 503 hp (375 kW) rear. With an optional towbar, the Model X has a towing capacity of up to 5,000 pounds (2,300 kg). At the 55 mph (89 km/h) towing speed limit in California, a Model X may have 70% of the 257 mi (414 km) EPA-registered range when pulling a 2,300 lb (1,000 kg) travel trailer. SAE J1772 inlet (North America; left); Tesla02 outlet (North America; centre). IEC Type 2 connector female outlet (Europe/Rest of World; right). The following table shows the EPA's official ratings for fuel economy in miles per gallon gasoline equivalent (MPGe) for the variants of the Model X rated as of 30 September 2015[update] and as displayed in the Monroney label. Tesla started taking reservations for the Model X in February 2012 without announcing prices. The standard Model X required a US$5,000 deposit, while the limited time production Signature model required a US$40,000 deposit in 2013. More than 20,000 Model Xs had been reserved by September 2014. In August 2015, user groups estimated around 30,000 Model X pre-orders had been received, compared to 12,000 for the Model S.
The first six Founders Series models were delivered at a market launch event in the Fremont factory on September 29, 2015. The first Signature edition was delivered on December 18, 2015. Pricing for the limited edition Signature version of the Model X varies between US$132,000 and US$144,000, while the standard production version of the Model X will be priced at US$5,000 more than a comparably equipped AWD Model S that is priced at US$75,000 for the base Model 70D. After the first quarter of 2016 all Tesla Model X deliveries had gone to US customers. Nevertheless, in January 2016 a Tesla car other than the Model S was registered in Germany and a Tesla Model X was sighted driving there with a license plate from Ingolstadt. Since the Audi headquarters are located in Ingolstadt, this led to speculation that Audi has acquired a Tesla Model X as part of its effort to develop its own battery-electric SUV. Tesla produced 507 Model X in the fourth quarter of 2015, of which 206 were delivered to customers. Model X sales totaled 2,400 units during the first quarter of 2016. According to Tesla Motors, deliveries were lower than expected because production was impacted by severe Model X supplier parts shortages in the first two months of 2016, and because Tesla had been too ambitious in wanting advanced features (committed "hubris"). The first Model X that didn't need corrections was made in April 2016. Sales during the second quarter of 2016 totaled 4,638 units. Although production was up 20% from the previous quarter, the number of vehicles in transit at the end of June 2016 was much higher than expected (5,150 including Model S cars), representing 35.8% of the number of cars delivered in the quarter (14,402 vehicles including the Model S). Global sales passed the 10,000 unit mark in August 2016. A total of 8,774 units were delivered in the third quarter of 2016, totaling 15,812 Model X cars sold during the first nine months of 2016. The Model X ranked as the top-selling plug-in electric car in Norway in September 2016. However, when Volkswagen Golf nameplate registrations are broken down by each variant's powertrain, the all-electric e-Golf registered 392 units, the Golf GTE plug-in hybrid 358, and the internal combustion-powered Golf only 242 units. Therefore, the Model X also ranked as the top-selling new car model in September 2016. Norway was the world's first country to have all-electric cars topping the new car sales monthly ranking. Previously, the Model S had been the top-selling new car four times, and the Nissan Leaf twice. According to Tesla, with 5,428 units sold in the U.S. in the third quarter of 2016, the Model X captured a 6% market share of the luxury SUV market segment, outselling Porsche and Land Rover, but behind seven SUV models manufactured by Mercedes, BMW, Cadillac, Volvo, Audi, and Lexus. With an estimated 9,500 units delivered worldwide during the fourth quarter of 2016, global sales in 2016 totaled 25,312 Model X cars, allowing the Model X to rank seventh among the world's top ten best-selling plug-in cars just in its first full year in the market. As of December 2016[update], cumulative sales totaled 25,524 units since its inception. 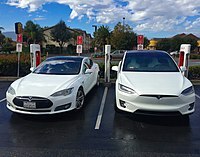 The United States is its main country market with 18,240 units delivered through December 2016, of which, an estimated 18,028 Model X vehicles were delivered during 2016, making the electric SUV the third best-selling plug-in electric in the American market that year after the Tesla Model S and the Chevrolet Volt. Registrations in California totaled 6,289 units in 2016, representing a 7.0% market share of the state's luxury mid-size SUV segment, ranking as the fifth best-selling car in this class, which was led by the Lexus RX with 20,070 units. Retail deliveries in China began in June 2016, and a total of 4,065 Model X vehicles were sold in 2016. Global sales totaled about 11,550 units during the first quarter of 2017. A severe production shortfall of 100 kWh battery packs limited the second quarter of 2017 global deliveries to just about 10,000 Model X vehicles, with a slight increase to 11,865 vehicles during the third quarter of 2017. An additional 13,120 units were delivered in the fourth quarter of 2017, for total annual deliveries of 46,535 units globally. As of December 2017[update], cumulative sales since inception totaled about 72,059 units. Global sales during the first nine months of 2018 totaled 34,630 units, allowing the Model X to pass the 100,000 milestone in September 2018, with 106,689 units delivered since inception. Consumer Reports wrote that the all-wheel-drive Model X 90D largely disappoints, as rear doors are prone to pausing and stopping, the second-row seats that cannot be folded, and the cargo capacity is too limited. Even its panoramic, helicopter-like windshield was disapproved of as it is not tinted enough to offset the brightness of a sunny day. Also, Consumer Reports added that overall "the ride is too firm and choppy for a $110,000 car". Motoring journalist Jeremy Clarkson's made his first review of a Tesla vehicle after 10 years on his TV show The Grand Tour in February 2018; Clarkson gave a positive review of the car that he called "fabulous" that is unlike anything on the road. Lawyers were present during the review presumably because Clarkson's previous scathing review of the original Roadster caused a lawsuit. On November 16, 2015, the Tesla Model X was chosen as AutoGuide.com's 2016 Reader's Choice Green Car of the Year and Luxury Utility Vehicle of the Year awards. The model was noted for its falcon-wing doors, long range, efficiency, and acceleration. On November 8, 2016 the Model X was awarded the Golden Steering Wheel (Das Goldene Lenkrad), one of the most prestigious automotive awards in the world, in the "Large SUV" category. Candidates for this award are nominated by hundreds of thousands across Europe for excellence across six categories. The Golden Steering Wheel jury, composed of professional race car drivers, accomplished technicians, editors, designers, and digital and connectivity experts, then spent three days judging Model X. On April 18, 2017, the American Automobile Association named the Tesla Model X 75D its Top Green Vehicle overall, as well as best in the SUV/Minivan category, with a score of 100/130. The vehicle scored 10/10 for its EPA Emissions Score, crashworthiness, Fuel Economy and Luggage Capacity. Though ambivalent toward Autopilot and the Model X's glass roof, AAA favoured its falcon-wing doors, and approved of the vehicle's performance, stating that its "acceleration is smooth and strong, as is the braking." On May 15, 2018, the Tesla Model X and Qantas set the Guinness World Record for "heaviest tow by an electric production passenger vehicle." The Model X was able to tow a 287,000 pound Boeing 787-9 nearly 1,000 feet on a taxiway at Melbourne Airport. The Tesla Model X has faced criticism for issues with the falcon-wing doors, which sometimes did not open or latch properly, and the windows, which sometimes did not open or close all the way. Tesla addressed these issues with several software updates, and no known issues remained after the 8.0 firmware was released. On June 27, 2016, Tesla settled on a lawsuit over usability concerns, accepting that the Model X was rushed to production before it was ready, and by October 2016, Tesla claimed the problems had been reduced by 92%. In 2017 Chinese newspaper Xinhua reported that security researchers from Keen Security Lab at Tencent were able to remotely gain control of the Tesla Model X, allowing them to remotely open the car's doors, blink the lights and control their brakes. They found zero day vulnerabilites that allowed them to install new firmware. The lead researcher for the team said they informed Tesla of the findings and most of the cars were patched by an update one month after Tesla was made aware of issues. As of October 2017[update], Tesla has had four product safety recalls the Model X. On April 11, 2016, Tesla voluntarily recalled 2,700 Model X due to safety concerns. During collision testing, it was found that the third-row seats would unlatch and fold over to the second row. Tesla urged customers to avoid using the third-row seats until after repairs. On April 20, 2017, Tesla issued a worldwide recall of 53,000 (~70%) of the 76,000 Model S and Model X vehicles it sold in 2016 due to faulty parking brakes that affect the Model S and Model X. The recall caused Tesla stocks to lose two percent of their value and added further questions about the reliability of Tesla's vehicles. In October 2017, Tesla issued an 11,000 vehicle recall for a faulty locking cable mechanism in the second row seats, estimating that about 3% of recalled vehicles may be affected. On June 13, 2017, the National Highway Traffic Safety Administration announced its crash testing results for the 2017-manufactured Tesla Model X, revealing 5-star ratings in all assessed categories, the only SUV to have done so. Tesla attributed the ratings to safety-focused design, in addition to a low centre-of-gravity resulting from its battery pack, adding "More than just resulting in a 5-star rating, the data from NHTSA's testing shows that Model X has the lowest probability of injury of any SUV it has ever tested. In fact, of all the cars NHTSA has ever tested, Model X's overall probability of injury was second only to Model S."  The Model X has yet to be tested by the Insurance Institute for Highway Safety. On December 30, 2016, a South Korean celebrity named Son Ji-chang filed a lawsuit against Tesla, claims of sudden unintended acceleration of his Tesla Model X. The lawsuit cites seven other Model X-related complaints registered in a NHTSA database dealing with sudden acceleration without warning. "The evidence, including data from the car, conclusively shows that the crash was the result of Mr. Son pressing the accelerator pedal all the way to 100 percent," Tesla said in response to the lawsuit. The NHTSA estimates 16,000 accidents per year in U.S. are caused when drivers intend to apply the brake but mistakenly apply the accelerator. ^ Lambert, Fred (June 14, 2016). "Tesla Model X is coming to Europe in volume just in time for the end of the quarter". Electrek. Retrieved June 14, 2016. ^ Lambert, Fred (September 8, 2017). "First Tesla Model 3 spotted in Europe a year ahead of official launch". Electrek. Retrieved September 8, 2017. ^ "Franz von Holzhausen Joins Tesla Motors as Chief Designer". TESLA. Retrieved January 17, 2017. ^ "Tesla Model X". Retrieved October 7, 2015. ^ "Model X Owner's Manual 8.0" (PDF). tesla.com. Retrieved July 31, 2017. ^ U. S. Environmental Protection Agency and U.S. Department of Energy (September 5, 2018). "2018 Tesla Model X 75D, Fuel economy and specs". Retrieved September 5, 2018. ^ a b c d U. S. Environmental Protection Agency and U.S. Department of Energy (September 26, 2015). "2016 Tesla Model X AWD – 90D and P90D, Fuel economy and specs". Retrieved October 3, 2015. ^ a b U. S. Environmental Protection Agency and U.S. Department of Energy (September 5, 2018). "2018 Tesla Model X 100D and P100D, Fuel economy and specs". Retrieved September 5, 2018. ^ "Tesla Model X GVWR Is 6,768 Pounds – Vehicles Qualifies For $25,000 Business Tax Deduction". Insideevs. ^ Garrett, Jerry (February 9, 2012). "Tesla Unveils Model X at Its Southern California Design Studios". The New York Times. Retrieved February 10, 2012. ^ Evans, Huw (February 10, 2012). "Tesla Reveals Model X Prototype". HybridCars.com. Retrieved February 10, 2012. ^ Tesla starts deliveries of the Model S/X 100D – new longest range electric vehicles – after EPA hiccup Electrek, March 15, 2017. ^ a b U. S. Environmental Protection Agency and U.S. Department of Energy (September 2015). "2016 Tesla Model X AWD 90D (90 kW-hr battery pack)". Fueleconomy.gov. Retrieved September 28, 2015. ^ a b c Mike Millikin (September 30, 2015). "Tesla CEO Musk launches Model X electric SUV: "safest SUV ever"". Green Car Congress. Retrieved October 3, 2015. ^ a b c d e f Cobb, Jeff (January 31, 2017). "Tesla Model S Is World's Best-Selling Plug-in Car For Second Year In A Row". HybridCars.com. Retrieved January 31, 2017. ^ a b c d e Tesla, Inc. (April 2, 2017). "Tesla Q1 2017 Vehicle Production and Deliveries" (Press release). Palo Alto: Market Wired. Retrieved April 4, 2017. Tesla (NASDAQ: TSLA) delivered just over 25,000 vehicles in Q1, of which approx 13,450 were Model S and approx 11,550 were Model X. ^ a b c d e "UPDATE - Tesla Q2 2017 Vehicle Production and Deliveries (NASDAQ:TSLA)". ir.tesla.com. Retrieved September 28, 2017. ^ a b c d e "Telsa Production Q3 2017". ^ a b c Tesla, Inc. (April 3, 2018). "Tesla Q1 2018 Vehicle Production and Deliveries" (Press release). Palo Alto. Retrieved October 2, 2018. Q1 deliveries totaled 29,980 vehicles, of which 11,730 were Model S, 10,070 were Model X, and 8,180 were Model 3. ^ a b c Tesla, Inc. (July 2, 2018). "Tesla Q2 2018 Vehicle Production and Deliveries" (Press release). Palo Alto. Retrieved October 2, 2018. Q2 deliveries totaled 40,740 vehicles, of which 18,440 were Model 3, 10,930 were Model S, and 11,370 were Model X. ^ a b c Tesla, Inc. (October 2, 2018). "Tesla Q3 2018 Vehicle Production and Deliveries" (Press release). Palo Alto. Retrieved October 2, 2018. Q3 deliveries totaled 83,500 vehicles: 55,840 Model 3, 14,470 Model S, and 13,190 Model X. ^ "Geneva show: Tesla Model X". Autocar. Retrieved March 14, 2013. ^ Ronald D. White (March 8, 2013). "Tesla plans to repay loans early, delays Model X". Los Angeles Times. Retrieved March 10, 2013. ^ Young, Angelo (November 6, 2013). "Tesla Model X Release Date: Superficial Production Next Year; Deliveries To Customers In Full Effect Later". International Business Times. Retrieved January 1, 2014. ^ Sebastian Blanco (November 5, 2014). "Tesla Model X delayed, again, but Musk says Model S demand remains high". Autoblog Green. Retrieved November 5, 2014. ^ Voelcker, John (February 9, 2015). "Why Tesla Model X Electric SUV Is Late: Range, Towing, 'Falcon Doors'". Green Car Reports. Retrieved April 8, 2015. ^ "Tesla sues Model X falcon wing door supplier". Autoblog. January 26, 2016. Retrieved February 13, 2016. ^ "Tesla settles court case with supplier over the development of the Model X's Falcon Wing doors". Electrek. Retrieved September 27, 2016. ^ Chris Ziegler (July 29, 2015). "Want a free Tesla Model X? Convince ten people to buy a Model S right now". theverge.com. Retrieved September 11, 2015. ^ Referral Program Different archive, from 26 August 2015 Tesla. Retrieved September 13, 2015. ^ Mark Lelinwalla, TechCrunch. "Tesla introduces a more affordable Model X." July 13, 2016. ^ "Tesla Model X 60D Upgrade To 75D Now Just $4,500". Inside EVs. April 27, 2017. Retrieved January 28, 2019. ^ "Tesla will leverage the Model X chassis to build its 'Minibus', says Elon Musk". Electrek. July 27, 2016. Retrieved July 29, 2016. ^ a b Kane, Mark (September 14, 2016). "Tesla Model X Crosses The 10,000 Sold Mark". InsideEVs.com. Retrieved September 15, 2016. ^ Tesla claims 'Quickest Production Car in the World' title with new 100 kWh battery pack: 0–60 in 2.5s & 315 mile range Electrek, August 23, 2016. ^ "Tesla increases base price of the Model X by making the 'Smart Air Suspension' standard". Electrek. October 7, 2016. Retrieved October 7, 2016. ^ "Tesla discontinues the Model X 60D with software-limited 75 kWh battery pack". Electrek. October 8, 2016. Retrieved October 8, 2016. ^ "Electric Cars, Solar Panels & Clean Energy Storage | Tesla". www.tesla.com. Retrieved January 28, 2019. ^ a b Bradley Berman (March 12, 2013). "Tesla Model X Production Won't Start Until Late 2014". The New York Times. Retrieved March 12, 2013. ^ "Model X | Tesla". www.tesla.com. Retrieved March 13, 2017. ^ a b "Model X". Tesla Motors. Retrieved August 23, 2012. ^ "Tesla Model X Acceleration vs Competing SUVs (+ More Spy Pics)". Gas 2. ^ Lambert, Fred (July 1, 2017). "Tesla introduces new performance enhancements to Model S and Model X". Electrek. Retrieved July 1, 2017. ^ "Tesla Model S, Model X Get 100D Variant with World's Best Range » AutoGuide.com News". AutoGuide.com News. January 20, 2017. Retrieved March 13, 2017. ^ "Model X – Tesla Motors". www.teslamotors.com. Retrieved September 30, 2015. ^ Zachary Shahan (September 23, 2015). "JB Straubel Answers (Trolls?) Tesla Horsepower Critics". Clean Technica. ^ Woodyard, Chris (September 30, 2015). "First drive: Tesla Model X is an awesome way to spend $132,000". usatoday.com. USA Today. Retrieved September 30, 2015. ^ "Range and Charging While Towing a Trailer – 2016 Tesla Model X Long-Term Road Test". Edmunds. June 29, 2010. Retrieved September 9, 2016. ^ "With trailer, Tesla Model X keeps 70% of EV range". Autoblog. April 7, 2016. Retrieved September 9, 2016. ^ U. S. Environmental Protection Agency and U.S. Department of Energy (September 2015). "2016 Tesla Model X AWD P90D (90 kW-hr battery pack)". Fueleconomy.gov. Retrieved August 23, 2016. ^ "P90D Tesla cars can be upgraded to P100D — for a price". Tesla Central. August 23, 2016. Retrieved August 23, 2016. ^ "Tesla Model X Reservations Hit 500 in 24 Hours". HybridCars.com. ^ Danny King. "Tesla Model X reservations 20,000 strong and counting". Autoblog. ^ "Tesla Motors Inc (TSLA) Model X Pre-Orders Cross 30,000 Units". businessfinancenews.com. Archived from the original on September 26, 2015. The table formed by TMC reveals that the electric vehicle (EV) company has received 30,027 Model X reservations worldwide. – The sedan was able to receive only 12,000 pre-orders ahead of its launch. ^ "Signature #1 delivered today". Tesla Motors Club. December 18, 2015. Retrieved December 19, 2015. ^ "Tesla Signature series Model X to begin delivery September 29". CNBC. Reuters. September 3, 2015. Retrieved September 4, 2015. ^ "Tesla's long-delayed Model X SUV hits the road as sales of luxury SUVs are booming". Retrieved September 30, 2015. ^ "Erstes Tesla Model X in Deutschland gesichtet" [First Tesla Model X sighted in Germany]. teslamag.de (in German). January 31, 2016. Retrieved April 10, 2016. ^ "Tesla: Fahrzeugzulassungen in Deutschland für Januar 2016" [Tesla: Vehicle registrations in Germany for January 2016]. teslamag.de (in German). February 5, 2016. Retrieved April 10, 2016. ^ Lambert, Fred (April 19, 2016). "Audi is reverse-engineering/benchmarking a Tesla Model X but doesn't know how to charge it". Electrek. Retrieved December 26, 2016. ^ a b Tesla Motors (February 10, 2016). "Tesla Fourth Quarter & Full Year 2015 Update" (PDF). Tesla Motors. Retrieved August 4, 2016. A total of 17,478 units were delivered globaly during the fourth quarter of 2015, including 206 Model X vehicles. Model S sales in the United States totaled 16,689 units in 2014 and 25,202 in 2015. ^ a b c Tesla, Inc. (April 4, 2016). "Tesla Delivers 14,820 Vehicles in Q1 2016; On Track for Full-Year Delivery Guidance" (Press release). Palo Alto: Market Wired. Retrieved April 4, 2016. ^ Blanco, Sebastion (May 5, 2016). "With Model 3, Tesla will approach manufacturing in a new way". Autoblog. Retrieved July 25, 2016. ^ a b "Tesla Second Quarter 2016 Update" (PDF) (Press release). Palo Alto: Tesla Motors. August 3, 2016. Retrieved August 3, 2016. During the second quarter of 2016 Tesla Motors delivered 14,402 new vehicles consisting of 9,764 Model S and 4,638 Model X. Production during 2Q 2016 totaled 18,345 vehicles. ^ a b Tesla, Inc. (October 26, 2016). "Tesla Third Quarter 2016 Update" (PDF). Palo Alto. Retrieved October 27, 2016. ^ a b Tesla, Inc. (January 3, 2017). "Tesla Q4 2016 Production and Deliveries" (Press release). Palo Alto: Market Wired. Retrieved January 4, 2017. Tesla delivered approximately 22,200 vehicles in Q4, of which 12,700 were Model S and 9,500 were Model X. ^ "Tesla Q2 2016 Vehicle Production and Deliveries" (Press release). Palo Alto: Tesla Motors. July 3, 2016. Retrieved July 3, 2016. ^ a b c Cobb, Jeff (October 11, 2016). "Almost Half The Cars Bought In Norway Last Month Were Electrified". HybridCars.com. Retrieved October 11, 2016. ^ a b Fred Magne Skillebæk (October 11, 2016). "Bilsalget september 2016 - Full fart forover!" [Car sales in September 2016 - Full speed ahead!]. Dinside.no (in Norwegian). Retrieved October 11, 2016. ^ Jose, Pontes (October 12, 2016). "Norway September 2016". EVSales.com. Retrieved October 12, 2016. ^ Randall, Tom (October 12, 2016). "Tesla Dominates U.S. Luxury Sedan Sales". Bloomberg. Retrieved October 14, 2016. ^ Cobb, Jeff (January 11, 2017). "America's Plug-in Car Sales Were Their Best Ever in 2016". HybridCars.com and Baum & Associates. Retrieved January 12, 2017. Plug-in electric car sales in the U.S. totaled 157,181 units, up 37.6% from 2015 (114,248). The plug-in car segment achieved an all-time high market share of 0.90% of new car sales in 2016. December sales totaled a record monthly volume of 23,288 units and also achieved a record monthly market share of 1.39% of new car sales. The top selling model for the second year in a row was the Tesla Model S with 29,156 units sold in 2016, followed by the Chevrolet Volt (24,739), Tesla Model X (18,028), Ford Energi Fusion (15,938), and the Nissan Leaf (14,006). As of December 2016[update], cumulative sales totaled 570,187 plug-in cars since 2008, with the Chevrolet Volt as the all-time best selling plug-in car with 113,489 units. The Tesla Model S ranks third with an estimated 92,317 units since its inception in 2012. ^ California New Car Dealers Association (CNCDA) (February 2017). "State New Vehicle Market Up Slightly in 2016; Similar Outlook for 2017" (PDF). CNCDA. Retrieved February 24, 2017. Registrations through December 2016 since 2012. Revised figures for 2015. ^ [better source needed] Schmitt, Bertel (March 4, 2017). "Tesla's Sudden Chinese Billion, Where Are The Cars Behind It?". Forbes. Retrieved March 6, 2017. ^ Tesla Model X Wins 2016 AutoGuide.com Reader's Choice Green Car of the Year Award, November 16, 2015. Retrieved March 23, 2018. ^ "Model X Wins the Golden Steering Wheel". www.tesla.com. Tesla Motors. November 8, 2016. Retrieved November 8, 2016. ^ "'Goldenes Lenkrad 2016' u.a. für Audi, Tesla, BMW und Renault" ['Golden Steering Wheel 2016' among others for Audi, Tesla, BMW and Renault]. www.markenartikel-magazin.de (in German). November 9, 2016. Retrieved November 10, 2016. ^ Valinsky, Jordan (May 15, 2018). "Tesla SUV earns a Guinness World Record for towing massive airplane". CNN. Retrieved May 18, 2018. ^ "Tesla Model X's Falcon Wing doors are significantly faster after v8.0 software update". Electrek. October 10, 2016. Retrieved October 25, 2016. ^ "Tesla says it reduced Model X issues by 92% amid criticism from Consumer Reports". Electrek. October 26, 2016. Retrieved October 26, 2016. ^ "Same Chinese white hat group hacks into Tesla for second year". Xinhua. Retrieved March 20, 2018. ^ Fehrenbacher, Katie (April 11, 2016). "Tesla Recalls 2,700 Model X Cars for Seat Problem". Fortune. Retrieved April 12, 2016. ^ "Tesla Recalls Model X Third-Row Seats After Failed Strength Testing". teslarati.com. Retrieved May 9, 2016. ^ "2016 TESLA MODEL X 60D SUV AWD LATER RELEASE". Retrieved November 5, 2017. ^ Lee, Timothy B. (June 10, 2016). "Tesla's real problem isn't that its cars are expensive. It's that they're unreliable". Vox. Retrieved April 21, 2017. ^ Lee, Timothy B. (April 20, 2017). "Tesla is recalling most of the cars it sold in 2016". Vox. Retrieved April 21, 2017. ^ [unreliable source?] In Depth: Model X the Safest SUV!. YouTube (who?). June 19, 2017. Retrieved June 19, 2017. ^ WP:PRIMARY source. Tesla Model X the First SUV Ever to Achieve 5-Star Crash Rating in Every Category, The Tesla Team, June 13, 2017. ^ Eun-Taek Lee (January 2, 2017). "Son Ji-chang in action against Tesla for SUA in U.S." The Dong-A Ilbo. Retrieved January 4, 2017. ^ Eve Peyser (December 31, 2016). "Man Files Lawsuit Against Tesla Claiming His Model X Spontaneously Accelerated Into His Living Room". GIZMODO. Retrieved January 4, 2017. ^ "Korean actor sues Tesla for 'sudden acceleration' accident". The Korea Times. January 1, 2017. Retrieved January 4, 2017. ^ "NHTSA Safety Advisory: Reducing crashes caused by pedal error". NHTSA. May 29, 2015. Retrieved January 2, 2017. 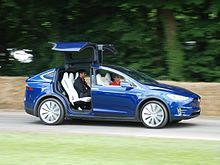 Wikimedia Commons has media related to Tesla Model X.